The 100% Natural Deodorant that Actually Works! Guaranteed free of parabens, propylene glycol and aluminum. 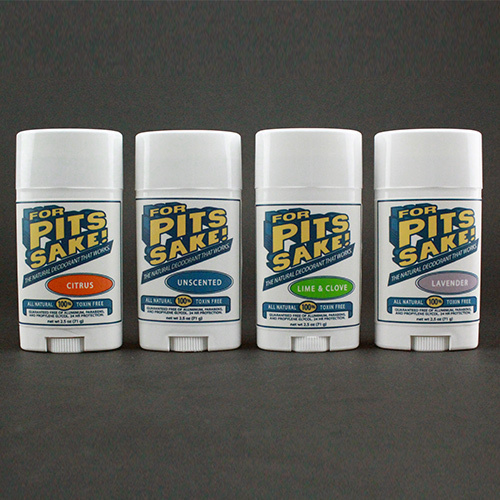 “For Pits Sake” Natural Deodorant uses a blend of natural antibacterial and odor absorbing ingredients to fight odor. Its soothing Virgin Coconut Oil and Shea Butter base is blended with aluminum-free baking soda and natural bacteria blocking, non-nano particle Zinc Oxide. This formula delivers results better than many of the natural deodorants we’ve tried. We aren’t satisfied with being the hardest working natural deodorant, we want it to be the hardest working deodorant period. Harmful Aluminum to block your pores and stop you from sweating. Hormone and endocrine disrupting synthetic fragrances to hide your stink. Carcinogenic ingredients like parabens to artificially preserve our formula. Synthetic Propylene Glycol to act as a base and carrier for synthetic ingredients, colors and fragrances. Some of mother nature’s best antibacterial and odor absorbing ingredients to keep you healthy fresh. A stick form that is convenient to carry and apply, and a consistency that is similar to the sticks you are used too. Did you know you can send our deodorants as an anonymous gift? Check out our “Deodorgrams” to send one of our sticks to the cute little stinker in your life! I bought the Lime and Clove scented deodorant and it is literally the best all natural deodorant I have ever used!! I sweat all the time, for no reason at all, and this stuff keeps me SO fresh. Even after leaving the gym I still smell good. I’m not joking when I say that I have tried literally EVERY natural deodorant out there. I found a really great one that blocked all odors, but continuously made my armpits irritated. Eventually I knew I had to switch! About 15 deodorants in on my continuous journey to find the perfect deodorant, I found this one! And not only does it smell great, it works! And best of all, doesn’t irritate my skin!! FINALLYYYYY!!!! We found a winner. I have tried many “natural” deodorants that do little to stop body odor and some that cause horrible irritation and rashes. I am allergic to aluminum and have had trouble finding a deodorant that works all day long. This one has been the best deodorant I have ever tried. I have ordered additional units for my friends and family. An exceptional natural deodorant that has withstood the searing humidity of a Florida summer. As an endocrine system cancer survivor I have been through many natural deodorants . . . . most which caused a rash or did not stop the underarm stink. Lime & Clove is my choice and indispensable for me. This is my all time favorite deodorant ever! I have carried it in my Chiropractic Practice and recommended it to my patients. LOVE IT!!! 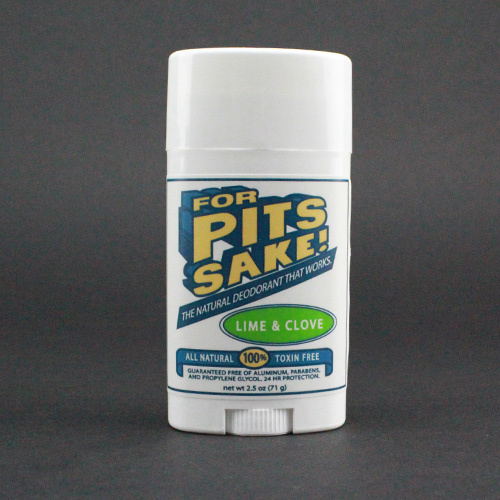 My personal favorite is the Lime & Clove; Lavender is a big hit with my patients. Been using the lime and clove and the citrus since May and not only is it an amazing product, it lasts a long time as well, I still haven’t even opened my unscented. Will buy again.